On Friday, Carrie Fisher (a.k.a. Princess Leia) made an appearance on Good Morning America to promote the newest Star Wars installment, and brought along a special guest: her dog, Gary. The segment was memorable, to say the least, and the internet didn't take long to express its fascination with this lovable dog. One outlet even described the French bulldog with a tongue to remember as "a national treasure." But something unexpected happened after Friday's interview and the subsequent media frenzy. Owners of other impressively tongued dogs began to tweet at Fisher with their own unique pet photos.
" Tongue brothers!" wrote one Twitter user. One after another, the dog photos started to pour in. 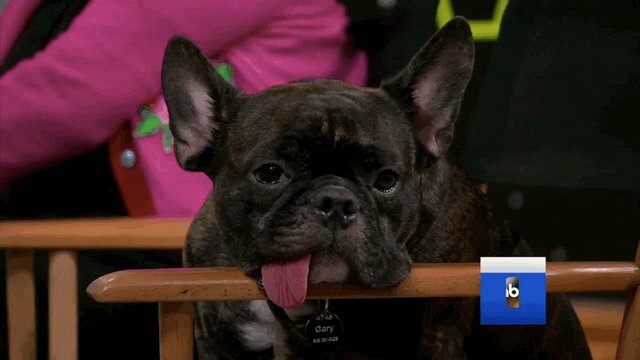 It was as if Gary had stared right through the TV and told other dogs with extraordinary tongues they weren't alone. So here's to you, Carrie and Gary! Thanks for reminding us that it's OK to be a little out there. Watch the hilarious interview with Fisher and her dog below.